It started with a simple idea: create a work of art on the names and character qualities of God revealed in the book of Psalms. . . .
During the spring of 2007, God placed this idea in my head. I had no clear direction, but figured I would begin studying the book and meditating on each chapter. Early in the process, I thought that maybe a continuous, horizontal display of the list of names and qualities I uncovered would make a nice work of art. Although this idea came, it lacked excitement for me and I abandoned it. seemed to relate to the character qualities and names of God found in Psalm 1. That doodle opened the flood gates. God ignited an unexplainable fire. Over the summer, I read the chapters and listed what I found, which caused me to learn more about my God and who He has created me to be. things flowing; and at times I'd draw one to two images, while other times eight to ten would just seem to fly at me. This happened during two days over Christmas 2007, a time when 45 sketches were completed - which finished this step of the process. What an exciting two days! Each sketch was transferred onto a pocketed banner for easy hanging and shipping in the event this might be a traveling show someday - a glimpse of the direction God was leading me. lasted about five days and the final steps, after painting, lasted about one day. I worked in sets of 10-12 banners on average until I reached Psalms 100, and then I worked on 20-25 at a time. Each image contains a grid for painting, often using the word Lord or God as many times as it appeared in the chapter. On rare occasions, were Lord appeared less than ten times, I used a random grid of intuitively made marks. I challenge you to search for every Lord and God in each work. Some paints were laid down randomly, others in a more organized fashion. 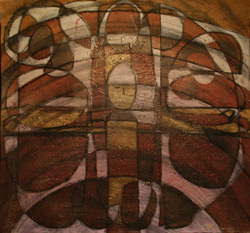 Once painting was complete, I would trace the lines of the grid in charcoal, splatter paint, and then sign each piece. To finish the piece, I added metallic and glitter spray paints and then a sealer. When all pieces were completed, I photographed and measured each. Early in the process, I set a goal to be done with the entire project in the summer of 2009. I figured that two years was a good deadline for completing 150 works of art, while being a mother of two boys, three and one. Little did I know that God had other plans as the series was completed March 7, 2008 - just nine short months after it began. What an amazing God thing! God also answered every prayer for financing as earnings from a commissioned work funded materials for the Psalms project.